Boston slip and fall lawyer Christopher Earley can help get you the compensation you deserve if you were injured in a slip and fall accident. In fact, we have recovered millions of dollars for our clients injured in slip and fall accidents. If you had a slip and fall accident you came to the right place for legal help. We are highly experienced and trusted lawyers that have settled hundreds of these cases through the years. A slip and fall is a type of personal injury. These accidents can cause very serious injuries. We welcome the opportunity to help you with your case. We are slip and fall lawyers in Boston that help people who have been injured by negligent property owners. Often these accidents could have been entirely avoided had a property owner exercised reasonable care to make their property safe. Examples of necessary safety precautions include keeping floors clean and in a non-slippery condition, ensuring that railings are properly secured, shoveling snow and clearing ice, making sure tripping hazards do not exist, and making sure stairwells do not pose a danger. Premises liability is the area of law that creates obligations on people and businesses to keep their properties safe. If you slipped and fell and you were not injured, then you don’t need a lawyer. But, if you did sustain injuries, then you need a lawyer. These cases are too hard for people to handle on their own, without the assistance of an experienced attorney on your side. The insurance company is calling me. Should I speak with them? Absolutely not. Nothing good can come from you speaking with an insurance adjuster before you have hired a lawyer to represent you. What if I was partly at fault for my slip and fall accident? Even if you were partly to blame for the fall, you still may have a valid claim to pursue. This is called contributory negligence and is very common with these types of personal injury cases. You are not barred from bringing a claim in this situation. Many – if not all – Massachusetts slip and fall claims have an element of contributory negligence. We only get paid if we obtain compensation for you for your injuries. That is called a contingency fee. If we don’t win, we don’t get paid anything, and that is a guarantee. If we get your case settled, we charge the customary 1/3, or 33.3%, of the total settlement as our fee. Not likely. The great majority of slip and fall accident cases in Massachusetts settle without the need for a trial. The chances of your case going to trial are quite slim. That depends on a number of factors. Is there negligence against the landlord, property owner, or whomever controls the property where you fell? Were you partly at fault for the slip and fall accident? What is the extent of your injuries? How much are your medical bills? Do you have permanent injuries? What if I slipped and fell at work in Massachusetts? In that case, you have a workers compensation case, and depending on the facts of your case, you may also have a third-party case as well. Hire us. We handle cases bothroughout the entire state of Massachusetts and we’ll come to you if that is easier for you. Are slip and fall case settlements taxable? No. Neither state or federal tax obligations are triggered by a settlement for a slip and fall accident case. There is no doubt these cases are challenging. Insurance adjusters typically are very skeptical of these types of accident claims, which often leads them to deny, or offer low settlement offers. The reason they are skeptical is because Massachusetts juries can be very harsh with their verdicts in these cases. This translates to very low jury awards, or worse, defense verdicts. However, despite these challenges, a slip and fall case can be strengthened by taking the appropriate action after the accident. What Type of Financial Compensation Can I Collect? Accidents in stores and supermarkets – These typically arise from spilled or broken merchandise/products, leaks, or improperly displayed merchandise/products. Slips and falls on snow and ice. Slips and falls on rental property. Slips and falls due to uneven or broken steps. Slips and falls due to broken or missing handrails. Slips and falls on staircases. Slips and falls on uneven flooring. Slips and falls in parking lots – These accidents happen from snow and ice, as well as improper elevation changes, or improperly maintained surfaces. Slips and falls at work – These falls involve workers compensation claims, and also possibly third-party negligence claims as well. Slips and falls on walkways. Slips and falls on freshly mopped floors. Slips and falls on construction sites – Construction workers face daily slipping and tripping hazards on construction sites. Slips and falls due to inadequate, or a complete lack, of lighting. Any and all other slip and fall accident cases. Due to our climate, slips and falls on snow and/or ice are extremely common in Massachusetts. These cases previously required a showing of an unnatural accumulation of snow or ice in order to prevail. This law changed in 2010 which makes it easier to win these cases. Now, a slip and fall victim need only show that a property owner failed to reasonably remove snow and ice. This is a much easier and fairer standard to meet, and allows many slip and fall victims to pursue claims for compensation, for claims that would have been impossible to win under the previous law. How Can A Boston Slip And Fall Lawyer Help Me? We are highly experienced lawyers for slip and fall accidents that have successfully settled cases that other lawyers reject. Our office begins by investigating the case to locate witnesses, collect photographs of where you fell, and secure video surveillance. We also frequently use engineering experts, as well as physicians, to provide us with expert opinions. We then gather all your accident-related medical records, medical bills, as well as photographs of your injuries. Once we have all of this, a settlement demand package will be sent to the insurance company. The slip and fall case at that point will either settle, or a lawsuit will need to be filed. We don’t file a lawsuit unless you want us to. Experience with all types of Massachusetts slip and fall accidents. Persistent dedication to each case to ensure the best possible case result. Access to top-flight engineers and other slip and fall expert consultants. Personal attention to each and every client we serve. I would recommend that you not try to handle your case on your own. These cases can be extremely complex. They require full investigation, research, fact-gathering, and proper preservation of evidence. It is important to hire a qualified lawyer to represent you. These cases are always hard because it is the burden on the plaintiff (the slip and fall injury victim) to prove his/her case. Failing to prepare the case fully and properly is only going to lead to a bad outcome for your case. Insurance companies fight these cases very aggressively. When you are representing yourself, you are only making their job that much easier to deny the claim, or offer you a low-ball settlement offer. Slip and fall lawyers in Boston (including us) only get paid if there is a settlement. That means you carry no financial risk in hiring an attorney for the accident. Given how difficult these cases are, and that the attorney works on a contingency fee basis, there is no reason for you not to have an attorney on your side. Many people think that if they slipped and fell on someone’s property, then the property owner is automatically responsible. That is not true. Regardless of where you slipped and fell, or what type of slip and fall case it is, you must be able to show that the owner of the property where you fell is liable to you. Liable means the property owner is legally responsible for your injuries. If the accident was solely the fault of the fall victim, then there is likely no viable claim to pursue. 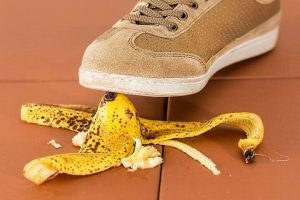 Generally speaking, in order to prove liability, Massachusetts slip and fall law requires that you show the property owner failed to act reasonably, which led to your fall. That is done by showing the property owner did something, or failed to do something, that caused you to be injured. In other words, negligence against the property owner must be proven in order for you to win your Massachusetts slip and fall accident case. Landlords in Massachusetts are required by law to keep rental premises safe for tenants and guests. When landlords are negligent and fail to keep the rental property safe, tenants are at risk of injury. Whether it be failing to remove snow and ice from walkways, driveways or staircases, or failing to reasonably maintain the rental property in any way, a landlord can be held liable for your injuries. We are accident attorneys with extensive experience representing tenants in all types of negligence claims against landlords and property owners. Massachusetts law also prohibits landlords from evicting, or taking any adverse retaliatory against a tenant for making a claim for personal injuries. It is important to not delay in bringing your slip and fall case. Securing videotape, photographs, witness statements and other evidence is critically important. Any delays can severely undercut an otherwise strong slip and fall accident claim. The statute of limitations for Massachusetts slip and fall cases is three years, with very few exceptions. Keep in mind too that many of these cases have strict notice provisions (presentment requirements). Failure to follow these deadlines can render a valid slip and fall claim moot. Don’t let that happen to your case. Contact us now to get answers to your slip and fall attorney questions, even on nights and weekends, and find out more about us. We will provide to you a completely free, no-obligation consultation. We will provide you an honest, up-front legal opinion as to whether or not you have a slip and fall accident case worth pursuing. We are very proud of, and have worked extremely hard to achieve, our reputation as successful slip and fall attorneys in the Boston legal community. We have taken on cases that other lawyers rejected and turned them into sizable settlements. We have worked hard to get our clients full and fair compensation for their slip and fall injuries. Our office is awfully proud of our overwhelmingly positive reviews received from our clients over the years. Read what our clients say about our slip and fall legal services, and our five-star Google reviews. We represent Massachusetts slip and fall accident victims in Boston, MA and we serve clients throughout Massachusetts including Cambridge, Somerville, Chelsea, Everett, Malden, Revere, Lynn, Lawrence, Andover, Newton, Quincy, Medford, Plymouth, Worcester, Fall River, Bellingham, Weymouth, Natick, Stoneham, Wakefield, Reading, Wilmington, Burlington, Lynnfield, Saugus, Peabody, Danvers, Middleton, North Andover, North Reading, Woburn, Canton, Stoughton, Randolph, Dedham, Norwood, Mansfield, Taunton, Brockton Suffolk County, Middlesex County, Essex County, Worcester County, Norfolk County, Plymouth County, Bristol County and Barnstable County.